According to 2013 statistics, the following are some of the most promising career fields that don't require a college degree, their median salaries and their projected industry growth. In 2002, Austin Jett graduated from Appalachian State University with dual degrees in anthropology and Latin American studies. "You leave with an anthropology degree, and what hard skills are you leaving with that are immediately transferable?" the 35-year-old asks. "The reality is, I don't know a lot of people who would hand you a business card that says, 'Anthropologist.'" Jett now is an employee benefits advisor at Russ Blakely and Associates and, while anthropology and Latin American studies may not factor into his daily work, what he learned while earning those degrees does. "Part of it is that it leaves you with a different perspective, a different world view," he says. "I do believe I've employed that along the way, in interactions with people and jobs and certainly with different cultures. "In a direct way, no, [my degrees] haven't applied, and I don't resent that one bit because I've used, in so many ways, what I learned." Jett is not alone in seeing his career stray far from what he studied. According to a November 2013 study by website CareerBuilder, about one-third (31 percent) of college-educated American workers age 35 and older are never employed within their degree field. 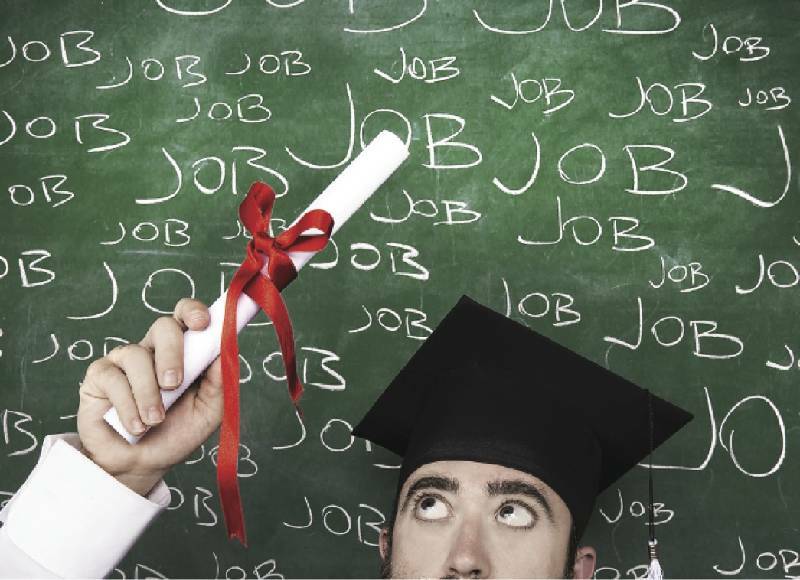 For recent graduates, the chances of working within a degree field are even more bleak. According to the CareerBuilder study, nearly half - 47 percent - of college-educated workers said their first job was outside their field. Jean Dake, director of the University of Tennessee at Chattanooga's office of career and student employment, is not surprised by those numbers. It's not unusual for students to be unsure what they want to do with their degree after graduation, she says. In fact, about 10 percent tell her they don't even want to work in the field they're studying. "People think, 'Oh, if I major in psychology, I have to be a psychologist. I have to go on and get a Ph.D. in clinical psychology,' " she says. "Well, no. Maybe you can do sales." In Jett's case, his employment history has been a series of leapfrog hops between industries that have made peripheral use of his education. Immediately after receiving his diploma, he moved to Costa Rica, where he spent four years teaching English at a university. After returning to Chattanooga, he served stints as a staff writer for a Spanish language newspaper, as a public relations official for Orange Grove Center and as a manager at Unum. Despite failing to find positions that took direct advantage of his education, he says he's happy with the unexpected path his career has led him down. "Rewinding back to the years when I was in school, I wouldn't change a thing because of where it's led me now," he says. "I've been fortunate to have unique life experiences. If you went back and undid [my majors], you would risk undoing those experiences." Even if it never directly applied to his employment, Jett's satisfaction with his education isn't uncommon among those who fail to use their degrees. According to the CareerBuilder study, about two-thirds (64 percent) of respondents working outside their field said they're happy with what they chose to study. Not all graduates share such fondness for an education that didn't pan out. Twenty-five years ago, Marty Bronson received a bachelor's in exercise science from the University of South Florida. After graduation, she relocated from Tampa, Fla., to Chattanooga to be close to Dalton, Ga., where she spent three months as an intern at the Bradley Wellness Center. At the time, she says, her job prospects seemed endless, with potential positions ranging from cardiac rehabilitation and chiropractic work to wellness centers. "I felt like I had so many options," says Bronson, 50. "There were lots of different ways I could have gone. Even all the carpet mills in Dalton had nurses in them to run smoking cessation classes and things like that." When the Gulf War started in 1990, however, people stopped hiring, she says. Bronson worked briefly at a walk-in clinic, where she wrote a program to encourage people to stop smoking, but she was soon let go. It was the closest she's come to directly using her degree. "That's probably the only [job] that was even remotely related to it," she says. Over the next few years, she continued moving further and further from her degree field, working at a collection agency and as a credit manager for several companies before applying in the late '90s to be an auditor for a Franklin, Tenn.-based healthcare provider. Still, while Bronson worried that her college degree wouldn't be applicable to other industries, employers assured her the important thing was that she received a diploma, not what she studied. "What I learned early on was that when I went to places, they would say, 'You have to have a college education,' and I would say, 'Yeah, I do, but it's a B.S. in exercise science,' and they would say, 'We don't care,'" Bronson recalls. "I was surprised that they were willing to hire me just because I had a college education." About a decade ago, her career shifted into sales, where her salary has ballooned. Now selling software to regional hospitals, she says she will earn well into the six-figure range this year. By comparison, average salaries for positions related to exercise science range from $19,000 for personal care aides to $55,000 for nutritionists and dietitians, according to the U.S. Bureau of Labor Statistics. Spending so many years scraping by on slightly more than minimum wage was "initial[ly] disappointing," she says, and she wishes she had known more about her degree's lack of earning potential while still in college. "You pay a lot for college, and I was making $8 or $9 an hour for a while," she says. "If I had had a different degree in something like nursing or something along those lines - or even teaching - I don't think I would have struggled as much at first." UTC's Dake says part of her job is to reassure students who have concerns about their post-graduation prospects that attaining a degree is a marketable achievement on its own. "[A diploma] shows that someone had the fortitude to finish that degree and to know the importance of learning a lot of different things," Dake says. "It shows that you're trainable. A lot of times, employers are looking for good analytical skills and, if you've gone through college, you've developed good analytical and problem-solving skills." Part of the disconnect between degrees and actual jobs may be linked to the depressed job market. About one-quarter of graduates surveyed in the CareerBuilder study said the demand for their degree diminished during the time they were in school. Of these, about one-third said they were forced to take lower-paying jobs outside their major after graduation. But the study also showed hope for these disappointed grads. Within two years of moving their tassels, about 60 percent of those who said they were forced to find jobs outside their field had managed to put their degree to work at a new position. Job markets are fickle, Dake says. In the four years a student spends at a university, jobs can become less promising or an entirely new career path can appear and become desirable. As a result, having adaptable expectations is crucial for graduates, she says. "We want them to build confidence in their skills and what they have to offer employers and that they be flexible in what they do after they graduate," she says. "Fairly often, they limit themselves in what they want to do and where they'll go for their jobs." And it's not unusual for graduates to drift away from their degree field over time, she says, even if they manage to secure a position early on. "I bet if you asked a lot of working adults 20 years later how many of them are doing the same thing they did when they graduated college, you'd get many different answers," she says. "I would venture that very few are doing the same type of work they did when they first left college." Regardless of where they find employment, college grads have accrued a mountain of debt that needs to be worked off. As of 2013, the Consumer Financial Protection Bureau estimated that outstanding student loan debt in the U.S. was about $1.2 trillion, equal to about $29,000 per student. That ever-increasing financial burden, combined with the economic recession, have led to a more cutthroat and desperate job market than the one Jett remembers entering a decade ago. It seems almost unfair to the current crop of college students, he says. "I almost feel like my generation had the luxury of being able to maybe not have as much forethought with where they were going with their degree," he says. "There wasn't that intensity around getting a certain degree or you're wasting money. There wasn't as much pressure." Even with competitiveness among degree-holding candidates at fever pitch, studies suggest the pay off of a college education is still well worth taking out a loan. According to a 2014 study by the Economic Policy Institute in Washington D.C., the wage gap between those who had attained a college degree and who hadn't is at its highest level. Last year, those with four-year degrees made 98 percent more per hour on average than degree-less workers, according to the study. That represents a 13 percent wider pay gap than a decade ago, according to the institute. Those numbers face Caleb Brown, 19, who this fall entered his freshman year as a mechanical engineering student at Tennessee Technological University. The 2014 valedictorian at Sequoyah High School, Brown says that, when he settled on a major, he wasn't concerned with its job-growth outlook or median pay, which are about 5 percent and $80,000, according to the Bureau of Labor Statistics. He just wanted to turn his lifelong passion into a career. "Ever since I was younger, I've been fascinated with things I can do with my hands," he says. "In high school, I did carpentry, just so I could ... figure out how structures work and how to apply math and sciences to solve problems." But with the prospect of at least four years between him and a degree, he admits that he's more concerned about whether he'll be able to turn that piece of paper into a paycheck. "I'm spending time and money and energy here trying to get that degree," he says. "It would pretty much all go to waste if I do not get a job in the field I studied for."